Do you love sleeping with dogs? Dogs are dubbed as human’s best friend, and I agree. Every dog owner would certainly agree to what I said. If you are a dog owner, you will be able to witness how extraordinary a dog’s loyalty is to his/her owner. Not only that, dogs give extreme happiness to the home. A recent study by Mayo Clinic suggests that allowing your dog to sleep next to you in bed helps you get a better quality of sleep. The study examined 40 adults with their pups for seven nights. 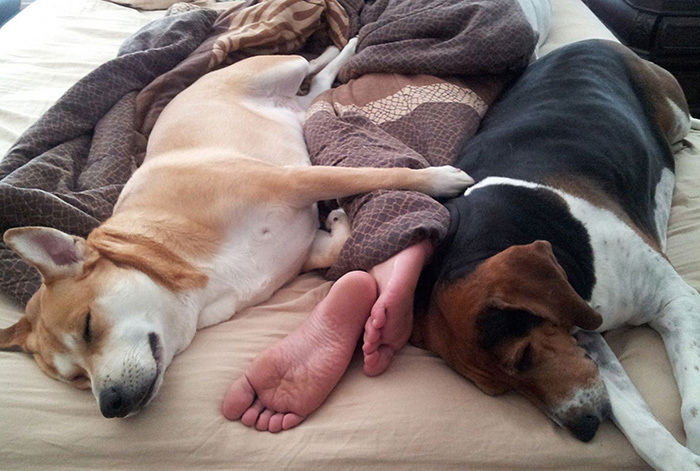 Both the humans and their canine counterparts wore motion-tracking devices to determine the quality of sleep. On average, people with dogs in their rooms (but not on their beds) maintained 83% sleep efficiency while people with dogs in their beds maintained 80% sleep efficiency. Since the new study was relatively small, the researchers weren’t able to determine whether the breed or size of the dog made any difference. And if you’re wondering how your dog feels about co-sleeping, there’s no need to worry.